Your firearm must remain in your holster until you are called to the line. Range officers will provide all instructions. If you have any questions or concerns, please feel free to contact Mike Fusco at rifle@harwintonrodandgun.com or at 860-496-0820. 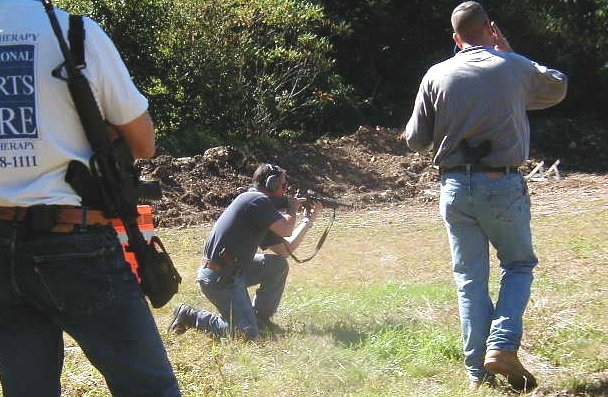 For directions to the Harwinton Rod & Gun Club, click here. "Safety First Foremost and Always"
The Harwinton Rod & Gun Action Pistol Matches are set up so that the average shooter may compete and have fun in a match style combat shoot. It is similar to a I.D.P.A. match, but scaled down slightly. Our shoots started in1997 when some of the HRG members and myself wanted to shoot a course with rapid fire. Using two or more targets and a timer we wanted to see how good we were able to hold our first match. It was a barricade shoot which those who attended enjoyed and couldn't wait for the next one. We add more to each shoot, improving upon the previous to the where we are today. Today we shoot three (sometimes fout) courses and have added a great event to the H.R.G. schedule. Our match events are easy to shoot. We commonly have children shooting the match with their parents walking them through. We commonly shoot the barricade event and have a maze of doors, walls, and hallways that the shooter must walk through while shooting and reloading under the clock. If you haven't seen one of our match events, stop by and check one out. You may just get hooked and join us.